The Wider Caribbean Sea Turtle Conservation Network (WIDECAST) is a Partner Organization of the United Nations Environment Programme (UNEP) and its Caribbean Regional Programme for Specially Protected Areas and Wildlife (SPAW). The network, comprised of Country Coordinators in more than 40 Caribbean nations and territories, connects scientists, conservationists, resource managers, resource users, policy-makers, industry groups, educators, and other stakeholders together in a collective effort to develop a unified management framework, and to promote a regional capacity to design and implement scientifically sound sea turtle management programs. WIDECAST's regional Sea Turtle Trauma Response Corps (STTRC) aims to strengthen and coordinate the efforts of people throughout the region to respond to sea turtles in crisis, whether at sea or stranded along the shoreline. In addition to peer-reviewed guidelines, Internet-based resources, information management software, and other technical products, the initiative provides access to training for field staff and volunteers, natural resource managers, veterinarians, and animal rescue practitioners. This online Veterinary Guide is intended to be a starting point for practicing veterinarians with little or no experience in reptile medicine, as well as an ongoing reference for those with greater experience. It is designed to provide the most current, up-to-date information, thus it is a "living document" with additions, changes, and new information added as soon as available. We welcome comments and suggestions to help improve the value and utitlity of the website. 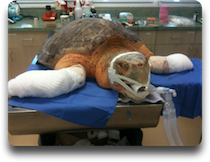 This guide complements WIDECAST's earlier Marine Turtle Trauma Response Procedures: A Field Guide PDF and Marine Turtle Trauma Response Procedures: A Husbandry Manual PDF, further encouraging standardized approaches with regard to sea turtle rescue, care and release. 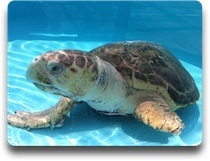 Florida Fish and Wildlife Conservation Commission's Holding Marine Turtles in Captivity PDF and United States Fish and Wildlife Service's Standard Permit Conditions for Care and Maintenance of Captive Sea Turtles PDF are also helpful. In veterinary medicine, there are often a number of ways to approach the treatment of a patient. The recommendations herein are provided by experienced sea turtle practitioners and will likely help avoid some of the more common pitfalls. However, it is understood that local resources will vary; each onsite veterinarian must be free to exercise their best clinical judgment and to make decisions based on prevailing circumstances. Sea turtles are protected as endangered species by the SPAW Protocol and are protected - in most cases year-around - by national law throughout the Western Atlantic region. 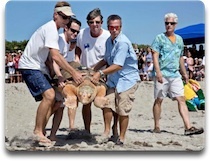 You may need specialized training and a state and/or federal permit to handle, transport, retain, or treat a sea turtle. This is certainly true in the US. Specialized actions, including euthanasia, may also need a permit (this is the case in the US). Contact the U.S. Fish & Wildlife Service and your state agency (e.g., Florida Fish and Wildlife Conservation Commission Marine Turtle Permit) or your WIDECAST Country Coordinator for details.